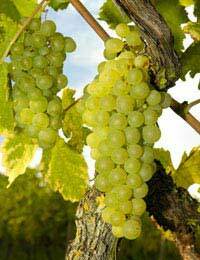 Riesling is a classic grape grown across Germany Alsace, Austria and Italy. It is also grown increasingly in the New World. It tends to produce strong and smokey wines, with slight acidity taste are generally low in cost. A very good German or Alsace Riesling can be picked up for around £6 in U.K. supermarkets. A good wine merchants such as the City Beverage Company in Old Street will usually have a selection of Rieslings, most of which will come in at a lower price than quality Burgundy or Bordeaux alternatives. The thing with Riesling, is that whilst it is strong in flavour it is inoffensive and not as extreme in its acidity and citrusy notes as many New World whites: It is a good wine to satiate the tastes of both the bright young things (who demand a bit of a kick in their white) and those who favour the old European wines over the New World varieties. Aged Riesling has what is often referred to as a Petrol aroma. Whilst this is sought after by some enthusiasts, many people prefer to consume Riesling when it is young and fresh. This petrol element is generally more popular in Alsace than with the German market, where the use of the term ‘petrol’ is avoided for its negative connotations. Riesling is sometimes used to produce a very sweet dessert wine – this is achieved by leaving the grapes on the vine for longer than usual, exposing them to a rot which naturally sweetens the grape prior to fermentation in the barrel. Riesling is believed to have originated in the Rhine as a cross between other grape varieties that are themselves relatively unknown. It is first recorded in 1435. Riesling is recorded as having been grown in Alsace before the 16th Century, and it is unsurprising that this region (bordering Germany) continues to produce German style wines: Alsace has changed hands from German to French rule many times in its history. Riesling was introduced to Australia in the first half of the 19th Century, and continues to be grown there where it generally produces sharp fruity wines, following the tendency for New World producers to emphasise the citrus flavours in white wine varieties. Riesling has been grown with great success in New Zealand since the 1970’s, where a more subtle wine is made than in neighbouring Australia. Marlborough Rieslings are much applauded, like so much of what is produced in New Zealand. Riesling is a great easy to drink wine, with both strong tastes and low alcohol – meaning it can be enjoyed throughout the evening. Tesco’s Finest Riesling, ‘Steillage Mosel-Saar-Ruwer’ 2006 comes in at just 11% vol and goes nicely with a Roquefort (try Tesco’s finest).Austrian Riesling has a peppery aftertaste and is generally more syrupy than its German counterpart. This and other Rieslings hold up well with spicy food, and make a good alternative to beer with Curry. Poached Fish, spicy meats and robust breads also make a good accompaniment to Riesling. For a good example of New Zealand Riesling try Marlborough, Montana Riesling 2005/06, available from Waitrose.